I love my veggies. I love them raw, steamed, roasted, grilled, sautéed and pureed. I just don’t grow them. In fact, other than the rare bonus packet of tomato seeds that comes with my annual seed order, I avoid growing vegetables. There, I’ve said it. Don’t get me wrong. I love the idea of growing and harvesting my own food, and the whole locavore movement (although I do have issues with the word. I think it sounds like “crazy eater.”) — it’s just that I’m more in love with the idea than the actual task. And the sad part is, I know I’m missing out on something. On many things. Part of my aversion comes from the multitude of garden pests. I know what they can do just in my flower garden – and squirrels have been known to push me over the edge. I just don’t think I could handle a) the vigilantism of protecting my food from varmints and b) the disappointment of seeing my dinner on someone else’s plate. I also feel that with vegetables, it’s either feast or famine – and both are ill-timed. When I’ve tried to grow tomatoes in the past, there were very few for summer salads. Instead, they all arrived at once at the end of the season – and let’s not forget the brown bags full of green tomatoes and an apple to help them ripen. The same goes for strawberry. Yes, strawberry – because that’s about all I was able to enjoy as a freshly picked dessert and I know I’m not alone. Here is some proof from Tidy Gardens by Jane. Of course, there is always canning and jarring and pickling. Although I certainly admire those of you who manage to grow and harvest and save, I will forever be the grasshopper from Aesop’s fable – picking over some mushy, tasteless supermarket produce while others enjoy a midwinter snack of summer sweet preserves on a warm, freshly baked roll. The bottom line is that I just don’t know enough about vegetables. 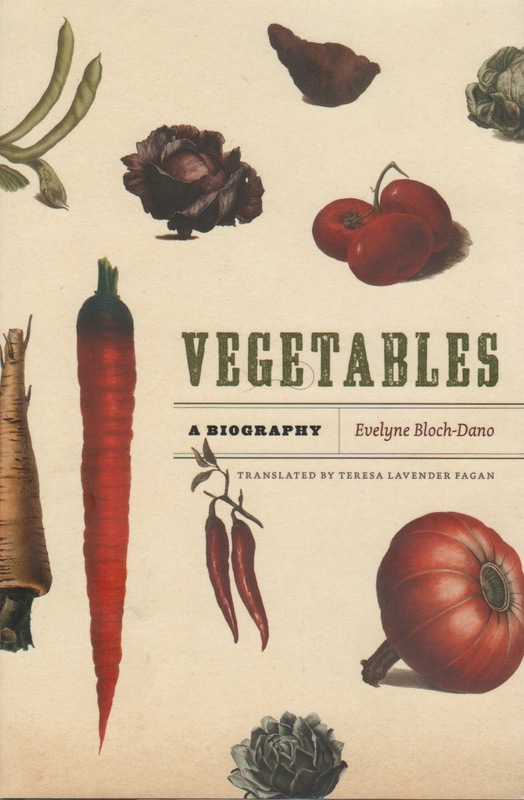 That’s why I was thrilled to find Vegetables: A Biography, by Evelyne Bloch-Dano. Translated from French, this small book provides fascinating details on the lives and history of the vegetables we love so much. Each chapter is devoted to a specific vegetable, and to support her work, Ms. Bloch quotes ancient texts and refers to literature and art (although the references to French literature were lost on me. Fortunately, the translator, Teresa Lavender Fagan, helped in that area). Perhaps what is most striking about this book is that it is more than a biography of vegetables. It’s also the biography of humankind – and both stories are intricately knotted. Take, for example, the carrot. According to Ms. Bloch’s research, until the 16th century, it was hard to tell a carrot from a parsnip, since both were white. Colored carrots, however, were dietary staples for people living in the Middle East and Middle Asia. Through trade and exploration, conquest and domestication, the colored carrot spread – and Ms. Bloch is able to date the movement of this spread through the still life paintings of Flemish artists. Sadly, there is no artwork or illustrations in the book. While that would have certainly enhanced the book, their absence certainly does not take away anything. While the book has not convinced me to throw myself into all-out vegetable gardening, I appreciate the idea that there is something in our DNA that moves us to work the soil, to plant and grow and harvest. We’ve been doing that for as long as humans first risked eating something green. 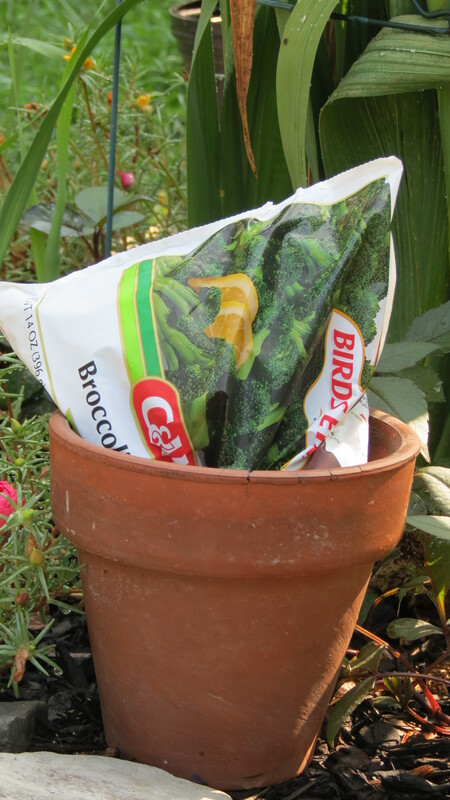 Maybe I should take a page from my own advice – and start off small with a vegetable that’s easy to grow. Green beans, perhaps? I love beans – steamed, or sautéed with garlic and then tossed with pasta. You might even say I’m locavore for beans — see what I mean about that word? Blog Update: A new tab, The Screening Room, has appeared at the top of the page. Although this is a gardening blog, a recent film, In The Land Of Blood And Honey, inspired me to create a page on which I can share some of the films I enjoy. I promise to keep the reviews brief. I hope you check back often. You never know when you’ll have some free time. I love growing vegetables! They can be beautiful as well as useful… the best of both worlds. I’ve found that any excess produce is gratefully received by friends (especially if I put it in a pie for some reason!?!). I live in Minnesota and our growing season is pretty short, so flowers, plants and grasses are it for me! I have no interest in a peck of green beans, but now and then a tomato plant or two. thats all! I love my vegetable garden, but it does give me fits sometimes. The weeds aren’t just unsightly, they are strangling my veggies. I’m on vacation right now, and I know that my tomatoes are ripening without me, and the zucchini are getting too big. My green beans this year were tasteless, and I don’t know why. Were they mislabeled at the garden center? Did I buy pseudo green beans? I’ll never know, so I’m pretending they are decorative additions to my garden. Well as you’ve witnessed my crops have been a disaster this year. Toms are now growing (about 2 months too late), still no sign of a hint of orange / redness, beetroot =total failure, lettuce a waste of time, spring onions planted in MARCH…yes you heard right…MARCH=hopeless. Chard=zero, leeks disappeared, radishes = big fat ZERO. But hey, don’t let that all put you off…lol. However, my first attempt to grow cucumbers in a pot despite rubbish conditions have been a huge success (post to follow)…if you like them, def’ give them a go next year…dead easy! I thought a locavore was someone who only ate while moving, or who only ate moving things. I do grow a few vegetables, but mainly to please my spouse. I would rather use the space for the many ornamental plants I don’t have and don’t have room for. Vegetables do seem to be problem prone. I enjoy growing herbs, though. I’m with you when it comes to herbs. They’re worth growing just to touch and smell — and they help bring flavor to the store bought produce. Nope. No vegetables here — other than the ones that come in bag or a can or (maybe) directly from the produce aisle. If I ever give vegetable growing a try, I will have to start off small and easy — and remember to not get carried away. Be well! Squirrels-Two pear trees and one apple tree and not a piece of fruit. Tree rats got it all. There will be no apple pie or pear cobbler this year. I certainly feel your pain — because I enjoy fresh-baked apple pie as much as you do. Jean, I like the way you think. 🙂 I guess it’s also getting to that time when you have to leave one home for the other one. That has to be difficult on some level. Hope all is well!